The final countdown to the Little Lady's first birthday is upon us (we're currently at T minus four days) so I'm definitely going to start shopping for some gifts for her soon. Probably tomorrow. A number of people have asked me what to get Rose for her birthday, so I've been racking my brain trying to come up with a few things that I think she would really like. After all, what do you get the girl who pretty much has everything, except for a competent Mother? We already have all of the usual first birthday gifts. Plastic push car? Got two parked in the garage. Sand and water table? Currently ground zero for a malaria outbreak on my back patio! What, then, would Rose really and truly enjoy if she could have anything in the world? 1. An iPhone. Rose spends most of the hours she's awake trying to steal my iPhone because apparently it's never too early for a girl to have a cell phone. I don't know who she's planning to call since she has all of one friend, and neither of them can speak, but that's beside the point. Girlfriend needs to stay up-to-date on all the current events so she knows what's going on when the other babies at the park are discussing Ben and Jen's divorce or Trump 2016. 2. Glasses. 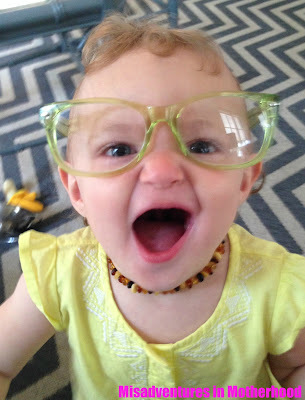 She doesn't discriminate between Daddy's reading glasses from Costco and Mommy's vintage designer shades; she is an equal opportunity glasses destroyer. If you are wearing glasses, especially if you need them to see, Rose will use all of her might to pull them off of your face. No toy, no snack, can distract her from the lure of a pair of specs perched on a nose. Beware the grasp of Rose because she is not one bit concerned about poking your eye out. After all, you have two. 3. Coins, screws, buttons, or earrings. Got a choking hazard sitting around? Throw that item in a box with a bow and watch Rose be overjoyed! Sister loves the taste of anything with the potential to block her airway, and she will be thrilled to eat whatever she finds between the cushions of your couch. Don't spend your pennies on a fancy gift, give them to Rose and enjoy her unbridled enthusiasm. Please come prepared with the knowledge of how to clear a choking child's airway. 4. Bras. Sure, puberty is (hopefully) about 11 years in the future, but that should never stop a girl from wanting a great piece of lingerie! Rose has already figured out that more expensive bras are better. She thinks that bras are one of the best things ever, especially when worn as a hat, or an eye patch, or used as a bowl for snacks. Because Cheddar Bunnies taste so much more delicious when presented in something purchased at La Petite Coquette. 5. Anything that is her Brother's. That's right, anything that he doesn't want her to play with is exactly what she wants. It might literally be a piece of garbage, or even a dirty diaper, but if Noah had it first, she wants it more than anything else in the world. If you don't let her have it she will scream loud enough to ensure that our neighbor calls CPS, but as soon as Big bro no longer wants something Sister is done with it too, because it is her mission in life to drive him crazy. I'm almost positive the one thing Noah wants for Rose's birthday is for her to go back from whence she came.